Yep. It’s that time of year again. The most wonderful time of year. College football has begun. The opening weekend–Weekend? It started on Thursday and ended Monday night–promises another exciting season of gridiron entertainment. 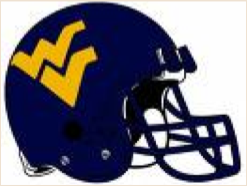 My beloved WVU Mountaineers won on Saturday, as did my second favorite team, the Trojans of Southern Cal, so I’m pretty happy at the moment. Did you see that game last night? Holy cow, what a finale! It pitted the Miami Hurricanes against the Florida State Seminoles. If you missed it, you missed one of the most exciting and entertaining games you’ll see this season. The game literally went down to the very last play, an incomplete pass in the end zone that preserved Miami’s lead and gave them the win. Had the pass been caught, and it almost was, Florida State would have won. All my college football watching is, of course, accompanied by knitting. 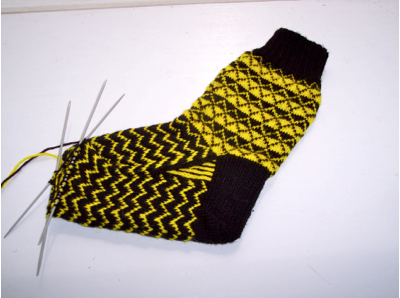 Cousin Vickie’s Steelers Diamonds sock #2 is nearly finished thanks to two football games yesterday. Just 1-1/2 more pattern repeats and a toe to knit and sock #2 will be an FO (finished object).